As I start making plans for 2015, I want to piggyback on what I learned in 2014. First, I recommend looking at the article in Educational Technology and Mobile Learning website for the “Excellent Rubric for Using Digital Portfolios in Class” article. One of the ongoing arguments against implementing new ideas is the work that goes into it. STOP. The work is done – you just have to access it! Yes, there are overwhelming choices. So stick to a looking at one or two that someone you knows recommends. Next year, you may try something new. Since our school has Google Apps for Education, maybe our students can start by using Google Docs to write a group paper and give a Google Presentation. More important than choosing the product is choosing to start. As we start on digital projects, we need to keep in mind that each and every person in the school house teaches citizenship and that includes DIGITAL citizenship. If you are ever confused or not sure where to start, please check with your school librarian. He or she can get you the help for your students. ISTE (International Society for Technology in Education) introduced a new citizenship poster in October. I like it because it starts the positive (A good digital citizen treats others with respect in online spaces and never cyberbullies), while showing the negative information. I don’t know how much it will help students, but I think it’s a great tool to help teachers understanding what they are dealing with in their classrooms. While incorporating technology in the classroom is important, let’s not forget the basics. Kids (even middle school kids – even HIGH SCHOOL kids) need to move their bodies. The NFL has some suggestions on their Fuel Up to Play 60 website. When you are using technology in the classroom, it’s a process – seriously – and it takes time to build for both the teacher and the student. 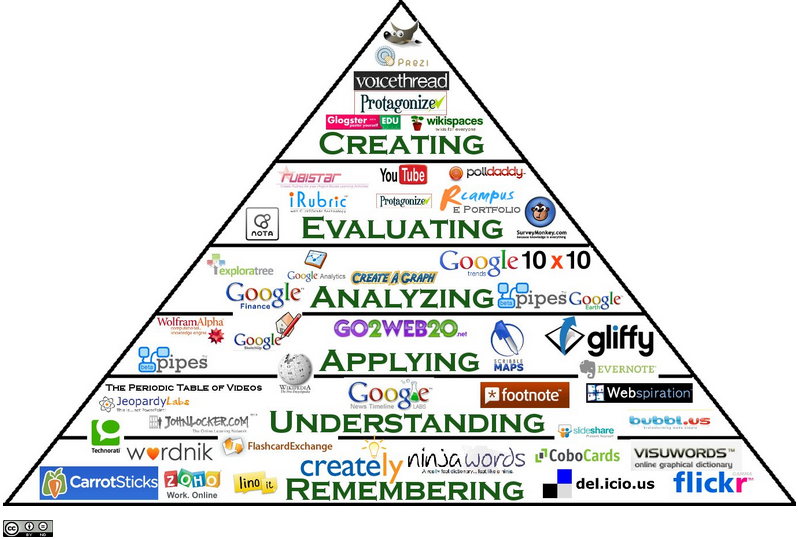 This visual was created by University of Southern Indiana for Digital Bloom’s Taxonomy – a Visual Bloom’s with appropriate technology tools for teaching and learning. Take one piece at a time, one tool at a time and let’s have fun!